For those unfamiliar with a "sales sheet" or "sell sheet", it a promotional flyer sent to dealers to generate excitement for an upcoming trading card product release. Below are a series of sell sheets from years that aren't this year. Some feature sports, others feature movie/TV shows and the rest feature themes only the brother-in-law of the guy who created the product would somewhat consider ripping a box and/or case of. The majority of these are "premium trading cards", so be prepared to see premium salesmanship as well, which means you'll need to resist the urge to rip in order to get through the article without spending several thousand dollars. The good news is that Cardboard Connection's favorite recovering rip-aholic Cornelius returns with the investment opportunity of a generation. *On a personal note, I did rip a half box of "Barbwire" cards in late middle school. Nice! I was worried when Cornelius canceled the Beber break. 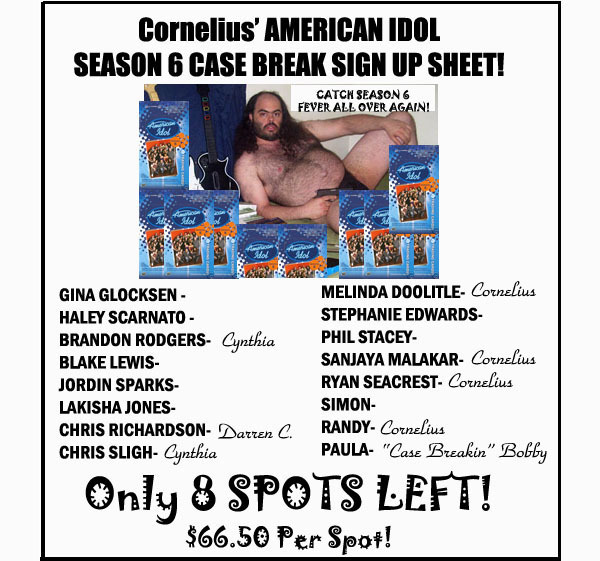 Update: Cornelius has officially ripped the American Idol Season 6 Case. He’s claiming the case was damaged and therefore had to rip it, he also claims to have a second case on the way. I’ll keep you posted per usual Steve. Oh Pamela looked so great in her Barbwire outfit. Nothing to be ashamed of by ripping that.